Although this 1961 key issue doesn't sell often enough to justify a higher spot on the 100 Hot Comics list, it is doing pretty well this year, with solid gains. The numbers don't lie -- but they can sometimes mislead. There have actually been four sales in CGC 7.0 since I wrote last year's update. This is the lowest by far. I would hold if you have one. 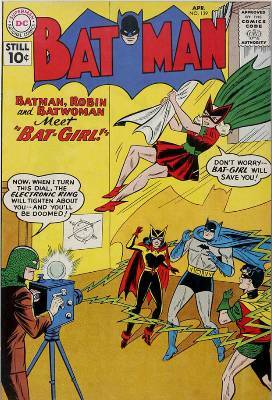 Betty Kane is presumably no relative to co-creator of the Caped Crusader, Bob Kane, but that hasn't stopped interest in her first appearance from heating up. Prices have largely followed the same pattern displayed by Batman #121 (first Mr. Freeze), and we expect sales to continue strongly on this tough Silver Age key issue comic book. Higher grade sales above 7.0 are very scarce, with none changing hands in the past few years. There isn't enough volume, especially at the higher grades, to make this book worth moving higher up the Hot Comics list. However, if it indeed follows #121 into the stratosphere, then it will be one you'll be glad you snapped up. 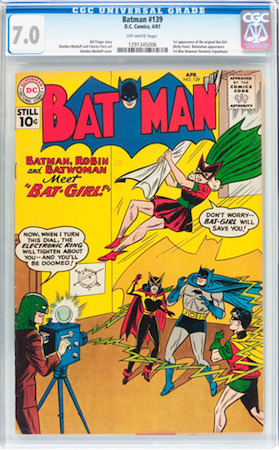 Buying a CGC 7.0 automatically puts you in the upper end of the scale for Batman #139. With only 203 copies in the CGC census and only 55 of those 7.0 or better, we really like this book in this grade. It's also affordable (for now). Nobody is suggesting Bat-Girl is in the same league as Mr. Zero / Mr. Freeze, but with a 7.0 of #139 costing about $1,250 versus $5,000 for the #121, you can see the potential.